BOSTON— July 1, 2015— Big Brothers Big Sisters of Cape Cod & the Islands (BBBSCCI) is pleased to announce that Richard “JR” Mell has joined the organization as Regional Director. In this role, Mell will serve as the chief ambassador for BBBS in the Cape and Islands region, engaging the community to increase awareness and visibility, supporting the organization’s growth goals. Mell has extensive management experience in the nonprofit sector. 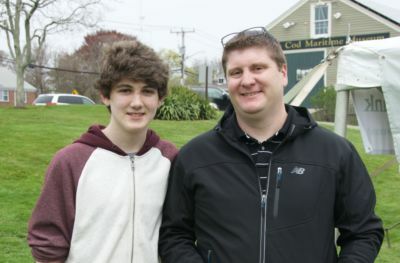 As a two time Big Brother on Cape Cod and the Islands, Mell has seen the impact a mentor can have on children enrolled in the program first hand. Mell’s connection and commitment to Big Brothers Big Sisters began in 2005 when he first became a Big Brother to a now 18-year-old senior in high school who he still keeps close contact with. Three years after the friendship officially closed, Mell was approached to become a Big Brother again and gladly stepped up to the plate. Mell joins BBBSCCI after serving as the Assistant Executive Director at the Boys & Girls Club of Cape Cod since 2006. With the help of his team through outreach, targeted initiatives, and marketing, Mell was able to grow the Boys & Girls Club of Cape Cod to serve an increase of over 61% of kids during his tenure. For more information on Big Brothers Big Sisters of Cape Cod & the Islands, visit www.bbbscci.org. Big Brothers Big Sisters of Cape Cod and the Islands is a proud member of the Big Brothers Big Sisters of Massachusetts Bay family and is the only one-to-one youth mentoring organization serving Cape Cod and the Islands. The organization is an innovative, energetic program that is making a real difference in the lives of 2,000 youth annually by providing them with an invested, caring adult mentor. With research and proven outcomes at its core, Big Brothers Big Sisters of Massachusetts Bay is working to ensure every child has the support from caring adults that they need for healthy development and success in life. The organization’s vision is to inspire, engage and transform communities in Massachusetts Bay by helping youth achieve their full potential, contributing to healthier families, better schools, brighter futures and stronger communities. For more information about this worthwhile cause and its important mission, visit www.bbbscci.org.